Through the years, our family has participated with family and friends in a long-running tradition of celebrating Good Friday. Our tradition has included an early morning breakfast and communion sharing, along with the telling of the story of the first Good Friday. The telling of the story has taken on different forms through the years. When our children were younger, we typically shared the story using Resurrection Eggs. When the children got older, I told the story using homemade ornaments similar to those on a Jesse Tree. (Note that the Jesse Tree link is for the traditional Christmas Jesse Tree. To make ornaments for a Good Friday Jesse Tree, I found pictures on the Internet representing the different elements of the story of the crucifixion of Christ. I printed the pictures and cut and glued them to circular pieces of cardstock. I wrote the associated Scripture reference on the back of each ornament, along with a number representing the order in which the ornament is to be hung. I then covered the ornaments with clear contact paper, hole-punched the top, and tied a piece of ribbon through each hole. I then handed out an ornament to each participant. As we read through the Scripture references on the back of each ornament [in order], we hung the ornaments on a "tree.") One year we simply took turns reading from Scripture. In 2009, our group had the pleasure of once again having some young children join us. Rather than going back to using Resurrection Eggs, I decided to write a lesson retelling the story of the first Good Friday in words that would be basic enough for children to understand. Why do we celebrate Good Friday each year? Why do we call this day “Good”? When we celebrate Good Friday each year, we are remembering the day Jesus died on the cross over two thousand years ago. Jesus died on the cross because He loves us so much. You see, God is holy. It is because He is holy that He cannot look at sin. Sin is disobedience to God. Even if any of us had only ever sinned just once in our lifetime (and if we are honest, we know we have all sinned way more than just once! ), but even if it was just once, that would be enough times to keep us away from God’s presence forever and ever and all of eternity. We cannot be in the presence of God’s holiness unless our sin is covered (or forgiven). God has existed forever and ever. Then God created the heavens and the earth and time and every living and natural thing, including the first man (Adam) and the first woman (Eve). God placed Adam and Eve in a beautiful garden and told them they could eat from any tree in the garden except one – the tree of the knowledge of good and evil. God told them that if they ate from that one tree, they would die. Adam and Eve disobeyed God and ate from the forbidden tree. That is the moment when sin entered this world. Remember, sin is disobedience to God. Immediately, Adam and Eve knew they had disobeyed their Creator; so they tried to cover their own sin by covering their bodies with fig leaves. God was angry that they had disobeyed Him. At the same time, He knew they could not cover their own sin with their own good works, so He mercifully and graciously provided a covering for them. He provided the blood sacrifice of an animal and made clothing from the animal’s skin to cover them and to cover their sin. God had established that the only way to have our sin covered (or forgiven) is through a blood sacrifice. Now we are going to skip ahead many, many years. God had set apart a special group of people. They were to be His people and He would be their God. They are called the Israelites; also known as the Jews. After some time, the Israelites eventually moved to the land of Egypt. When the Israelites became too many in number for the Egyptians, the new king of Egypt (the Pharaoh) made the Israelites work as slaves for the Egyptians. The Israelites cried out to God to help them. God raised up a man named Moses to deliver the Israelites from the hands of the Egyptians. Moses told the Pharaoh many times to let his people – the Israelites – go, but the Pharaoh refused to listen. Finally, God said He would bring a plague of death upon the firstborn of everyone in the land of Egypt. However, God mercifully and graciously provided a covering for the people of Israel so they would not have to endure the same plague. The Israelites would be spared from the plague of death if they covered the doorposts and lintels of their houses with the blood of a perfect lamb. If they did this, the spirit of death would pass over them, and the blood would cover them like a blanket of protection. That is why they call that day the first Passover, because the spirit of death passed over the Israelites who were covered by the blood of the lamb. God did finally deliver the Israelites from the hands of the Egyptians. After He delivered them, He led them through the wilderness while He was bringing them to a special land that He had set apart for them. During this time in the wilderness, God gave the Israelites some special laws, which included the Ten Commandments. He gave the Israelites these laws not to make them perfect; that is because the laws could never make them perfect. Instead, God gave the laws to show them how much they needed a Savior. At the time God gave the laws to the Israelites, He also showed them how to set up a special Tabernacle where God would dwell among the Israelites. In the Tabernacle was a special place called the Holy Place. A curtain separated the Holy Place from another room called the Holy of Holies. In the Holy of Holies, there was a special seat called the Mercy Seat. This is where the Spirit of God would dwell among the Israelites. There was only one man allowed to enter the Holy of Holies one day a year on the Day of Atonement. 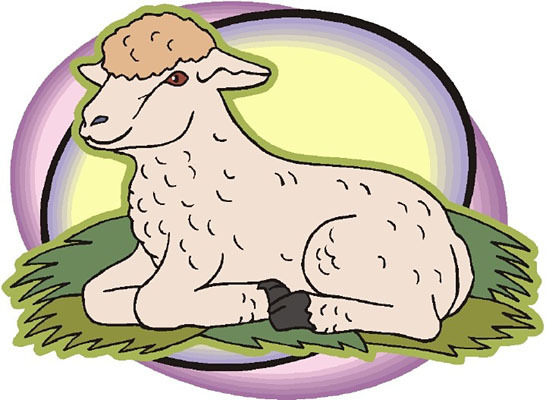 On that special day, the High Priest was to take the blood from a perfect animal sacrifice in with him in order to sprinkle the blood on the Mercy Seat. It was only through the sprinkling of the blood by the High Priest that the people could be forgiven of their sins. Again, we see that sin separates us from God and that the only way we can approach God is if we have been covered by the blood of the perfect sacrifice. Now we are going to fast forward through some more time. Through the years and decades and centuries, God spoke through special people whom He called prophets and told the Israelites that He would send a Deliverer … a Savior … the Messiah. This Savior would be the only One who could save the people from their sins. This Savior would offer the final blood sacrifice. The Savior had to be a perfect sacrifice – a perfect Lamb. Since there was no one on this earth who was perfect, God had to come to the earth for us to save us from our sins. And so, God came to live among us as one of us. God the Son, who was Jesus the Christ – fully God and yet fully human – came to the earth to be our perfect sacrifice. This Savior, Jesus, was born to us as a baby. We celebrate His birth when we celebrate Christmas. Christmas is not the end of the story, though. Jesus grew to be a man. He walked on the earth performing many miracles and forgiving people of their sins, showing us that He is God. Sadly, this made many people angry. They did not like that Jesus was claiming to be God. They did not like that Jesus was telling them they might look good on the outside to the rest of the world because of their good deeds, but to God their good deeds were like filthy rags and they desperately needed a Savior. The people became so angry that they eventually cried out for Jesus to be crucified. This brings us back to why we celebrate Good Friday. This is the day we remember when Jesus was crucified by being hung on the cross. I know that does not sound like a day to be celebrating. The thing is, Good Friday is both a sad day and a happy day. It is sad because it is the day Jesus died on the cross. Yet, it is happy because it was only by Jesus dying on the cross for us that we can be forgiven of our sins. Remember, our sins can only be forgiven if they are covered by the blood of a perfect sacrifice. Jesus, the Lamb of God, was that final and perfect sacrifice. Even though that is the really happy part of why we celebrate Good Friday, this is not even the end of the story. There is something even happier that came on the third day after Jesus was crucified. We celebrate that day as Easter Sunday, or Resurrection Sunday. You see, even though Jesus died on Good Friday, He did not stay dead. On Sunday morning, He was raised from the dead! He lives forevermore! And we can live forever with Him if we believe Jesus died for us and that it is only by being covered in His blood that we can be made right before God. Do you understand you have offended our holy God by sinning against Him (by disobeying Him)? Do you understand and believe Jesus died for your sins and that the only way to be with God forever and ever is by accepting Jesus’ sacrifice on the cross for you? Do you want God to forgive you of your sins – to cover your sins with the blood of Jesus? Do you want to be able to live with God forever and ever in heaven and not have to live away from God for all of eternity in hell? Do you believe Jesus rose from the dead and is alive today? If you do, then ask God the Father to forgive you of your sins, and thank God for coming to the earth in the form of a man and dying on the cross for you, and ask the Spirit of God to help you follow Him for all the rest of your days.